Arsenal Injuries: Who Could Miss The First Game? 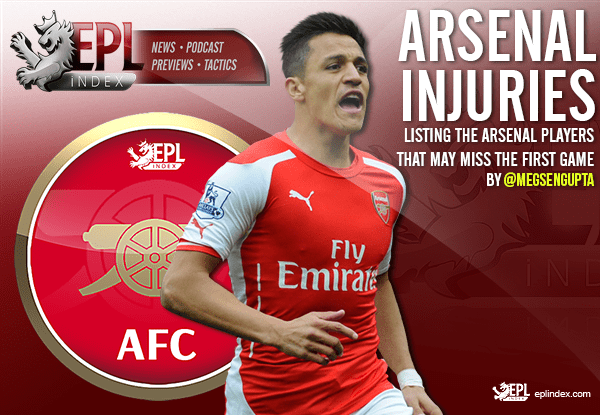 EPL Index > Arsenal > Arsenal Injuries: Who Could Miss The First Game? Arsenal and Arsene Wenger have been the recipient of a lot of bad luck as they seem to be facing some issue or the other, every single season. However, with their opening game against Liverpool, the Gunners appear to be face-to-face with a problem already. Wenger is likely to find himself without some regular players for the opening of the season, including his top two forwards. That will leave Theo Walcott as the only option up front, unless Wenger manages to find himself a striker in the transfer market. The Euro 2016 and Copa America might have been entertaining tournaments but the truth is that they have only tired the players out more, putting them at a greater risk of injuries. Here’s a list of Arsenal players who will be likely to miss out on the first couple of games. High on winning the Copa America, you’d think Sanchez would be able to harness some of that power for the Gunners. Unfortunately, he injured his ankle following a nasty challenge in the final against Argentina. Sanchez is in recovery right now, but he did struggle to get into form at the start of last season, which was also after an exhausting summer, thereby meaning that Wenger would be looking to give him some rest before playing him. Germany’s loss had a rather saddening effect on Ozil, but the plus side is that it allowed him to rest a few days, and this could prove crucial for the Gunners. Ozil was among three Germany players who were rested for Arsenal’s first games in 2014 after winning the World Cup, and could be given the same treatment this time. If so, that could give Jack Wilshere a chance to show what he can do in the No. 10 role for Arsenal. Giroud played an important role for France in the Euro 2016 and scored three goals. His run was pretty impressive and he also enters the season as Arsenal’s only true centre-forward, with Danny Welbeck out injured until next year. However, a tournament like the Euros is bound to have some sort of physical strain on even the best of players and Giroud is all set to be back in training less than a week before the Liverpool game. Aaron Ramsey was touted as one of the best midfielders in the Euro 2016, and rightfully so. He was suspended for the semis, so he hasn’t played a game since July 1. Although he might be fit, the question is – will Wenger by willing to risk starting him already, especially with how injury-prone he can tend to get? Arsenal have many other options in central midfield if so, including Granit Xhaka and Santi Cazorla. The centre-back is in the same position as Giroud after being a mainstay in France’s team at the Euros. When fit, Koscielny is a given starter for the Gunners but he struggled with an inflamed Achilles last season and Wenger could make sure he gets plenty of rest to avoid a similar problem. That would leave him with only two true centre-backs in Per Mertesacker and Gabriel Paulista — neither of whom looked particularly convincing last season. Categories: Arsenal, Arsenal (NN), EPL Index Featured Article, and EPL Team Analysis.' 'Tags: AFC, Alexis Sanchez, Arsenal, Arsenal (NN), Arsenal Stats, Giroud, Koscielny, Koscielny Opta Stats, Ozil, and ramsey.